The future saint and martyr for his Faith was born in 1872 in the city of Kremenetz in the Volhynia area of western Ukraine, the son of a priest, who was the Dean of the Volhynia Seminary. After graduating from seminary, he continued his studies at the St. Petersburg Academy, from which he graduated in 1895. He was then sent as a missionary to America and assigned as Reader at the St. Nicholas Church in New York City. Soon he married and was ordained to the priesthood in 1896 by Bishop Nicholas, and was assigned as the pastor of St. Nicholas Church/Cathedral, where he served for eighteen years. Father Alexander worked in close collaboration with Bishop Tikhon when he was Bishop of North America from 1898 until 1907. The future Patriarch, Tikhon, admired his young priest’s sincere piety, pastoral love and deep theological erudition. St. Alexander’s labors for Orthodoxy in America are multi-faceted. He labored hard, with much success, to bring back to their Orthodox heritage many of the Uniates who had been immigrating to America from Galicia and Carpatho-Rus’. He established many new parishes—in Yonkers, Passaic and Philadelphia—and throughout North America. He was the editor of the influential educational periodical, the American Orthodox Messenger, published in English and Russian. He was actively involved with the running of the Mutual Aid Society, which provided vital help to Orthodox immigrants. Fr. Alexander is especially remembered for being responsible for the construction of the architectural marvel, St. Nicholas Cathedral in NYC, (which celebrated its 100th anniversary in the Fall of 2003). 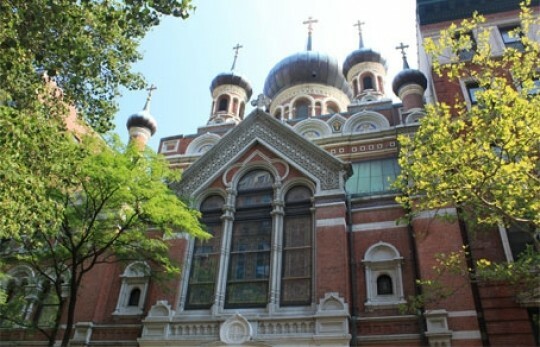 In 1903 Bishop Tikhon transferred the center of the Russian Orthodox Diocese of America from San Francisco to New York, making St. Nicholas the Diocesan Cathedral. At the tenth anniversary of Fr. Alexander’s ordination, Archbishop Tikhon expressed his praise for the future saint’s character and priestly devotion to the service of Christ’s Holy Church. 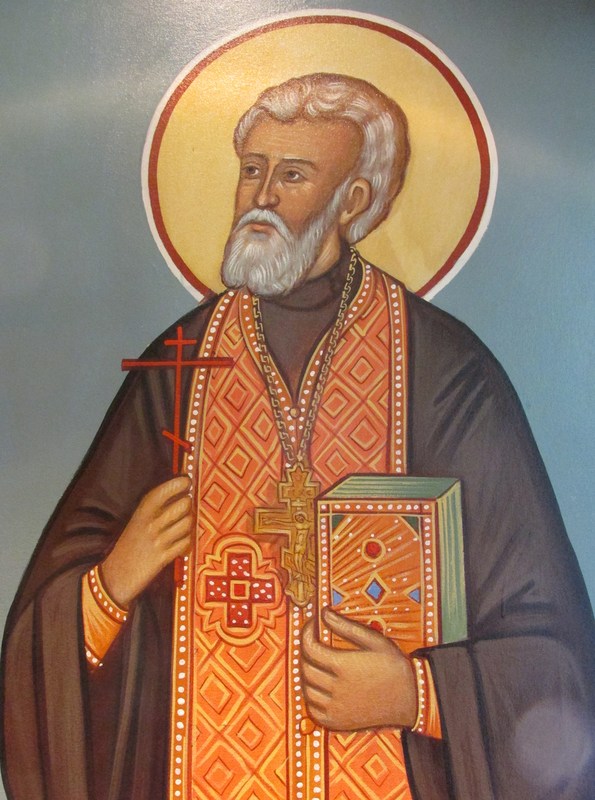 Finally, in 1914, the New-Martyr Alexander was transferred, concluding his 18½ years of sacrificial and dedicated pastoral service to Orthodoxy in America. In his farewell address, he expressed feelings of profound love and gratitude towards his spiritual mother, the American Orthodox Church, as an ever-grateful son. After three years serving at the Cathedral in Helsinki, Finland, as the assistant to Archbishop Sergius, (the future Patriarch), the Passion-bearer Alexander was transferred to Christ the Savior Cathedral in Moscow. Once again he was to collaborate with Saint Tikhon, the Metropolitan of Moscow, who became Patriarch of All Russia a few months later at the Church Council of 1917-18, which was in session during the Communist Revolution. Both saints believed that the fate of Russia was at stake and the Church should struggle to save the nation from the Communists. Christ the Savior Cathedral became the center of anti-Communist resistance, and Fr. Alexander helped to establish a Cathedral Brotherhood which led the Church’s resistance. He drafted a document that appealed to the faithful not to surrender their churches and their holy things to the godless, but to rise up and protect their holy things. In 1920 and 1921 Fr. Alexander was briefly arrested—for having a church school. In 1922 Patriarch Tikhon forbade his clergy to cooperate with the now wide-scale confiscation by the State of the Church’s sacred vessels, for which he was arrested. The persecution of the Church and its clergy radically intensified. The Hieromartyr Alexander supported his Patriarch unwaveringly, and drafted a resolution protesting the confiscation of the Church’s holy things. He was arrested again, for “criminal counter-revolutionary activity.” Following a high-profile court case, he was sentenced to ten years. Patriarch Tikhon was released from prison, and issued some statements regarding loyalty to the government, after which Fr. Alexander and many other imprisoned church leaders were released. But a year later, in September 1924, the Passion-bearer was arrested again and sent into exile in the far north for three years, which greatly weakened his failing health. During this time St. Tikhon died as a martyr-confessor. After Fr. 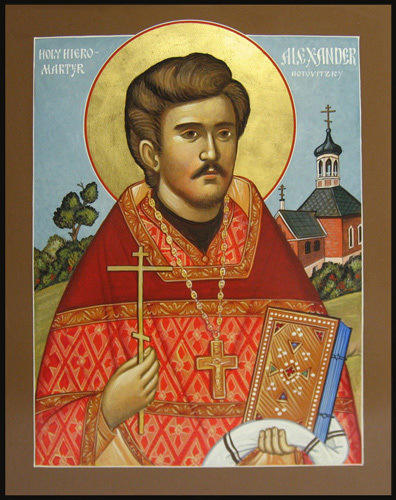 Alexander was released, he became a close assistant to the new Patriarch, Sergius, with whom he had served in Finland. One of the parishioners at the church where he served during his final years commented that she saw the same light shining in Father Alexander’s eyes as she saw in the holy Patriarch Tikhon’s eyes, and that it was testimony of his sanctity. In the fall of 1937 the New Martyr Alexander was arrested once more, never to be heard from again. Hieromartyr Alexander is venerated as a Passion-bearer, whose life as a confessor ended with sufferings and martyrdom for Christ.